The Texas Rangers acquired Ryan Dempster from the Chicago Cubs for Single-A right-hander Kyle Hendricks and Single-A third baseman Christian Villanueva. And suddenly a Rangers-Braves World Series becomes a tantalizing prospect. Last week, the Braves thought they had a deal for Dempster, with talented, young righty Randall Delgado headed to Chicago. 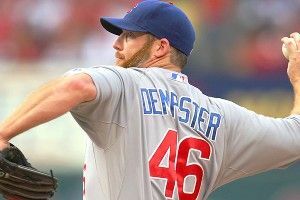 But Dempster exercised his veto rights as a 10-year veteran with five years on the same team, saying he didn’t want to go to Atlanta, and that his first choice was to go to the Dodgers. When L.A. balked at the rumored offer of dynamic Double-A right-hander Allen Webster, the Cubs audibled and struck a deal with Texas, just a few minutes before the 4 p.m. ET deadline. The Braves’ loss is the Rangers’ gain, and Texas might’ve given up less talent to make it happen. Dempster, 35, ranks second among all qualified starters with a 2.25 ERA. You could’ve made a lot of money betting on Ryan Vogelsong and Ryan Dempster to be 1-2 in the majors in ERA at the deadline, if such a wager existed. Earlier this season, Dempster racked up 33 scoreless innings in a row. He also missed more than three weeks at one point with a shoulder injury. But he’s been one of the most durable pitchers in the game, having topped 200 innings for four straight seasons, ranking 16th in innings pitched from 2008 through 2011; the Rangers reportedly chose Dempster over fellow Cub Matt Garza both because Dempster came cheaper, and because they felt better about Dempster’s health than Garza’s. Dempster owes much of his success to improved control this year: He’s walking just 2.3 batters per nine innings, the lowest mark of his 15-year career. He’s shown a big platoon split over the course of his career, yielding a .275/.371/.441 line against lefties versus just .244/.314/.380 against righties. But this year he’s shut down hitters of all kinds, and actually been stingier against left-handers: .197/.259/.298, versus .221/.266/.346. As this heat map from ESPN Stats & Info’s Mark Simon shows, lefties have been rendered impotent on all Dempster offerings save for those right down the middle. There’s a leap of faith in play here. Dempster owns a 177 ERA+ this year, versus an 80 ERA+ in 2011. He can thank, in part, a much-improved Cubs defense for that jump: The Cubs ranked 17th last season in Ultimate Zone Rating, versus an impressive fifth this year. But however much Dempster has relied on defense and/or luck for his improvement (.242 batting average on balls in play this year, versus .301 for his career), he figures to get just as much defensive support in Texas, where the Rangers rank fourth in UZR. With Roy Oswalt a big question mark, Neftali Feliz headed for Tommy John surgery, Zack Greinke landing in Anaheim, the upstart A’s continuing to win, and Texas hoping to finally break through after two straight losing trips to the World Series, acquiring Dempster to stabilize the rotation makes lots of sense. Especially at the price the Rangers paid. While top third-base prospect Mike Olt had his name bandied about in various deadline rumors, Texas didn’t touch Olt or any other elite prospect to consummate the deal. Villanueva, 21, did eke his way onto Baseball America’s 2012 top 100 prospects list, making it at no. 100. He’s got some bat, hitting .285/.356/.421 this year at a Myrtle Beach ballpark that murders offense, and not just when La Flama Blanca is pitching. Hendricks, 22, isn’t as highly regarded by scouts. But he has posted a gaudy 112-15 strikeout-to-walk rate in 130⅔ innings for that same Myrtle Beach team this season. The combination of the two players is considered to be an inferior return for the Cubs than Delgado would have offered.